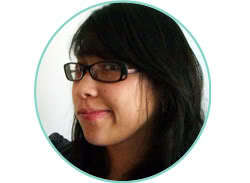 It seems like this is a week for surprises and today our lucky contestant is Kat from Sew Chibi. Kat just had a baby the cute Akira and a bunch of us have gotten together for a virtual baby shower! 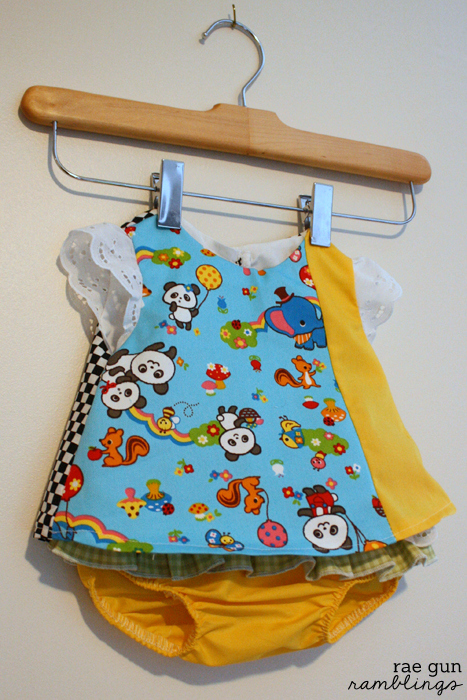 Rachael of Imagine Gnats encouraged those of us participating to sew something up for baby Akira in Kat’s signature style. 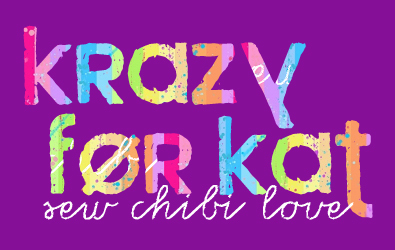 If you aren’t familiar with Sew Chibi, let me tell you what I LOVE about Kat’s style. First off she’s pure geek in a great way. She’s always sewing up fun quirky geek cultured inspired wearables, think anime, my little pony, Totoro, and more. Also she’s uses color so wonderfully. when I think of Kat I think bright colors. And finally she’s great with brave pattern pairings. 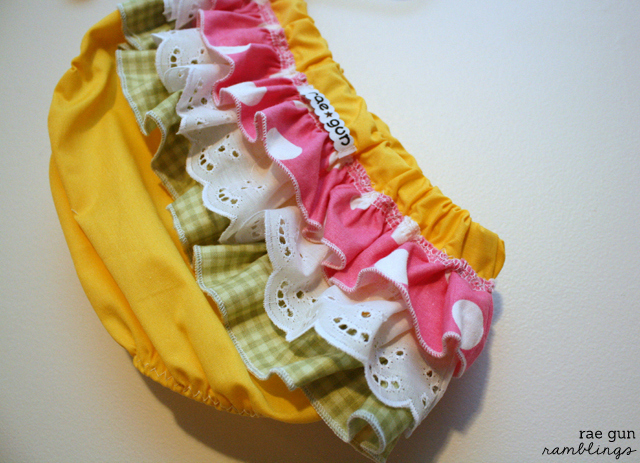 So I made what I’m calling a 3 panel dress to send off to Akira and Kat along with a pair of coordinating ruffle diaper covers like I sell in my shop. I made the dress kind of tunic length to show of the bottoms a little more. I find it just as easy to make the asymmetrical 3 panels by cutting out a front dress piece of your favorite basic A-line dress pattern of both front fabrics. Then I just cut off center and match up the two different fabrics. 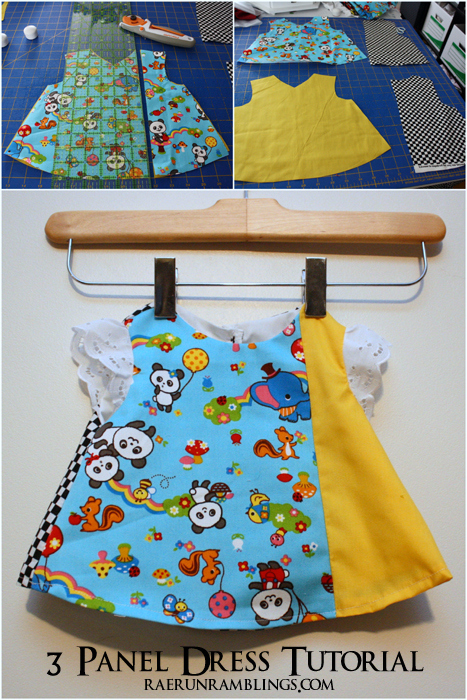 Then before following the normal pattern instructions I sew the two pieces together. 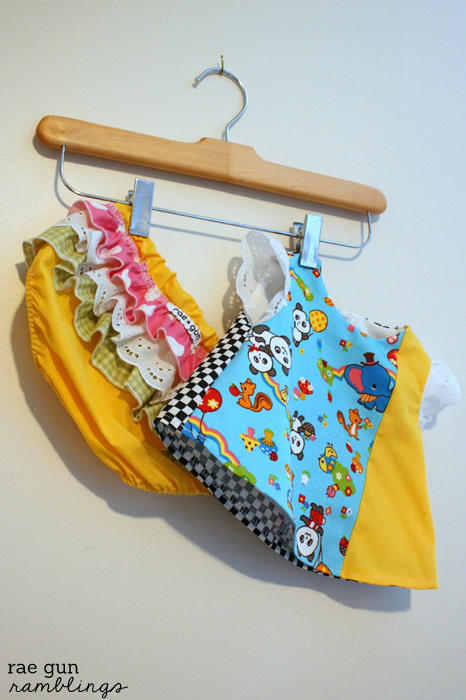 So I hope you like this funky, colorful, pattern mix up baby outfit. And if you haven’t visited Sew Chibi before make sure to hop on over and check out her awesomeness. Also you can see plenty of cute pictures of baby Akira on Kat’s Instagram account. omg! SO SO cute :) i’m smitten! LOVE all the ruffley goodness!!! Cute, cute! Marissa!!!! You really shouldn’t have!!! It’s so perfect! I ADORE the fabrics and the piece-y look to it.. all the colors and patterns!!!! I’m on the edge of my seat excited to see Akira in this!!! I must make something for little Teddy too! And seriously, how are you handling getting stuff done so well?! This is my third time and I scurrying around like a chicken with it’s head cut off! Brava, lady!!! Best mom ever!!! You amaze me! I got nothing done on my maternity leave and I still haven’t been able to finish up much sewing as time goes by. I adore this dress! 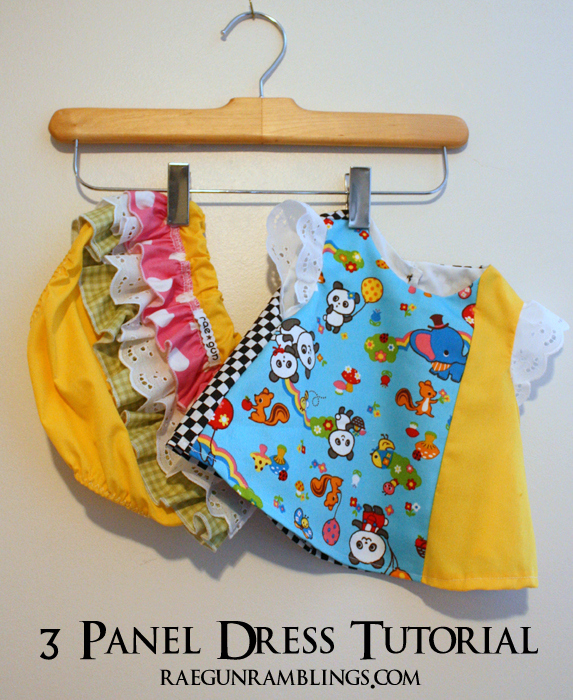 I need to make one for Olive for sure. You can use any basic A-line dress pattern to get this look.